When God calls us to do His work and to be obedient it doesn’t mean it’s going to be easy. Yesterday, I met with a lady who works for YoungLives. It’s a beautiful ministry through YoungLife that ministers to teen moms. I didn’t really know why God wanted me to meet with her but I felt it was important. I was thinking I was going to meet with her to see how Building All Children can help the children of the teen moms. Little did I know that God was taking a moment for me to learn?!? An opportunity to learn from this leader! She was a woman full of the Truth and she shared a story with me that I want to share with you. Everyone needs a little encouragement! So they figured out what route to take. The king of Edom and his troops joined them, and all three armies traveled along a roundabout route through the wilderness for seven days. But there was no water! The troops had NO WATER FOR SEVEN DAYS! The three kings felt defeated…. that the Lord had brought them there to let the king of Moab defeat them. They realized they needed help. They started asking for a prophet, and one of the kings officers realized that Elisha son of Shaphat was there. The kings knew that the Lord would speak through Elisha so they went to him. “Why are you coming to me?” Elisha asked. While Elisha was seeking God and listening to music the power of the Lord came upon Elisha, and he said “This is what the Lord says: This dry valley will be filled with pools of water! BUT it wasn’t that easy…they didn’t hear what they wanted to hear. Elisha told them to “DIG DITCHES!” They haven’t had water for seven days and they were suppose to dig ditches? It was about being obedient and trusting that the Lord would provide for their needs. So guess what? Yep, all three armies started digging ditches. Digging until the valley was full of ditches. Digging ditches was hard work, and digging with no water to refresh them must have been even harder. I can’t even imagine how hard it was to dig the ditches while being so thirsty, but we serve an amazing God and He provides. The Lord provides; He filled the ditches with water…enough water for the troops, cattle, and all other animals. I learned yesterday that I am digging a ditch! I am creating, listening, seeking, and working hard and the Lord will fill it up! It’s not easy, and the digging is hard, but the Lord will provide as long as I seek and follow His ways. 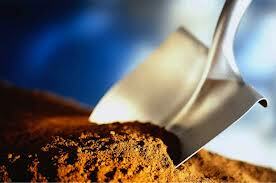 I believe we all should be digging…what ditch are you currently digging? Maybe you’re digging for your children. ..trying to provide the very best for them. Or, are you digging for your marriage? Some of you might be digging for yourself… just trying to survive. Keep digging! HE WILL FILL IT UP! The work is hard! But I’m grateful to be called to something so special! I will keep digging and trusting that HE will provide! Wonderful reminder to be obedient. Thank you!